Common Cause | Сайт детского православного лагеря. V. М. Filippov, Minister of Education of Russia, who once said that “the upbringing of youth is the common cause of state, society and church”, Common Cause aimed at joining the efforts of more than 20 federal, public and religious organizations in order to hold the IDY. The youth camp was set up upon the blessing ALEXANDER, Archbishop of Kostroma and Galich, Chairman of the Department for Youth Affairs of the Holy Synod of the Russian Orthodox Church. The camp was supported by the Staff of the Moscow Military Command and the Committee for Family and Youth Affairs of the Moscow Government. After our morning prayers Hieromonk Rafael (Belovolov) who came from the city of Vorkuta gives us his blessings for our good deeds and from that moment on life starts boiling up. On 29 July IDY participants splashed out of the camp and joined the procession that accompanied the Translation of the Relics of St. Seraphim from Diveyevo to Sarov. In Sarov the Alexy II, the Holy Patriarch of Moscow and All Russia, was consecrating the church in the name of St. Seraphin of Sarov built near the Saint’s cell. Bell ringers, gonfalon bearers, choir members... Sun, sky, thousands of people... Even the zealots who remained on duty in the camp enjoyed the fete and the joy from the nearness and help of St. Seraphim. 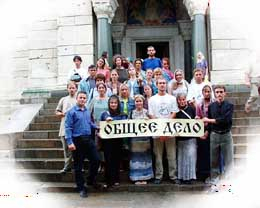 Diveyevo is a special place where miracles are a part of everyday life. If you look closer – every step you make here is accompanied by a miracle, be it even a small one: a miraculous concatenation of circumstances, a happy meeting... In the evening one could hear stories about such “miraculous concatenations” on that day. Father Alexy Shevchuk, a priest from Tver, told us about the help given to him by St. Seraphim. In the morning just before the procession he received a message from his daughter saying that she was to pass her first entrance exam in a university and asking him to pray for her. Before starting on the procession Father Alexy conveyed this message to his scouts who had come with him to the camp. Later in the same day another message came from his daughter. She advised him that she passed the first exam with an “Excellent” result and was enrolled without having to pass the other two. “We were never sure that she would pass the exams at all!” – concluded Father Alexy. Many of the pilgrims visited the holy springs, walked in the St. Seraphim’s groove just as St. Seraphim had once precepted, prayed and worked in the Convent. Our impressions of all this were most bright and joyful. The zealots had a happy chance to fulfill the commandment to love and serve thy neighbor: guarding and cleaning of the camp, cooking... A few words about the meals. “The catering was brilliantly organized, - wrote an IDY participant just before the departure. – No one could ever guess when the people on duty would make the meals on their field-kitchens. This enabled us to walk alone, separately from groups, to the monastery, to the springs etc. without having to observe the lunch hour”. By the evening of July 31 the festivities in Diveyevo reach their peak: the maximum number of pilgrims come to this God-saved place, we even have to give them some of our tents; in the Convent at this time the last stones are laid in the paved paths and the last flowers are planted. At noon our gonfalon bearers and bell ringers set off to meet the procession returning from Sarov to Diveyevo with the relics of St. Seraphim. Others are meeting the relics in the Diveyevo Convent. Chimes, sky and people, people, people... The Holy Patriarh arrives. The ceremonial meeting of the relics in the St. Trinity Cathedral of Diveyevo Convent. Demonstration of the divine service on a large outdoor screen. Numerous fathers in the yard of the Convent taking confessions and dispensing unction… the Holy Day! - Happy Holiday! Christ has arisen!.. The most unexpected event that occurred during our stay in the God-saved village of Diveyevo was our departure. Preparations for the journey home, trips to the Convent to say goodbye to it, the last concert of the bards, the farewell camp-fire in the fields... that was all. But an image has imprinted itself in our hearts: Diveyevo, festivities, tents, sky, sun, people, friends and, of course, St. Seraphim of Sarov who has become very dear to us and who fills us with his ardent love.